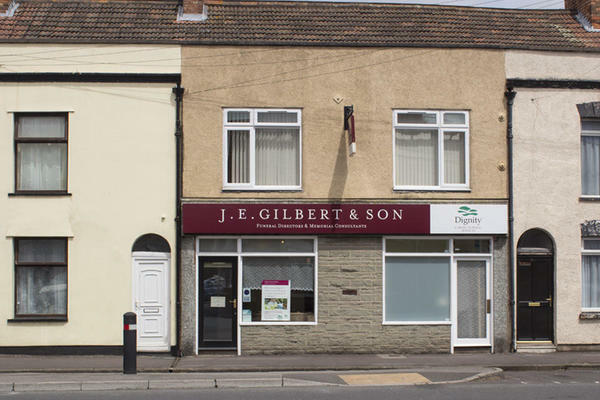 J E Gilbert & Son Funeral Directors has long served the families of Bridgwater, Somerset, providing quality funeral care that places your needs first. We are here for you now and available to arrange the funeral of your loved one. As the oldest established funeral directors in Bridgwater, we know how difficult this time will be for you. Our experience, the principles of which have been passed down through the years, allows us to offer you tailored support, as well as ensure that you, your family and friends can pay your respects in the manner you see fit. Regardless of the style of funeral you want for your loved one – religious, humanist, traditional, contemporary – the service will be carried out in accordance with your wishes. Our funeral home, which underwent a full refurbishment in 2010, is situated on St John Street in Bridgwater. This location, at the centre of the town, allows us to not only help local bereaved families, but also those in the wider Sedgemoor district. This includes the towns and villages of Cannington, North Petherton, Puriton, Westonzoyland and Woolavington. If you wish to spend some time with your loved one before the funeral, we have a private chapel of rest. It can be opened outside of normal hours if you or your family wish to visit at a time more convenient to you. The team at our Bridgwater funeral directors will be on hand to provide guidance and offer advice when you need us. We are here to arrange the funeral of your loved one. Call us today. Call us today on 01278 422344 to talk through your personal requirements. At J E Gilbert & Son Funeral Directors, we understand how special life is with those that you love. For us, every funeral is unique and personal. We have a service to fulfil every wish, with every detail carried out with the same uncompromising quality of care. From a traditional service, to a colourful woodland burial, your options are limitless with our Full Service Funeral. If you have a little more flexibility when it comes to arrangements, then we can provide a Simple Funeral for a lower cost. There is parking outside our funeral home. We are situated on the main roundabout linking St. John Street to Bridgwater Railway Station. Our staff are available 24 hours a day on 01278 422344 if you require our services outside of these hours.